“Going to the first barrel was always Rootie’s hardest spot,” two-time NFR qualifier Britany Diaz said of her mare Dasher Dude. Diaz was having a hard time keeping “Rootie” from fading into the first barrel. Barrel racers who have experienced the same challenge on their own horses describe what feels like a magnetic force pulling the horse to the barrel and out of position. The problem was, Rootie wasn’t staying square or responding to the cues Diaz was giving with her inside hand and leg. Diaz turned to her hauling partner and veteran NFR qualifier, Lisa Lockhart, for advice. Compiling Lockhart’s suggestions with Rootie’s needs, Diaz created this month’s problem-solving drill. Keeping a horse collected and square is key to keeping it from fading and also to managing adverse ground conditions. In order to keep a horse gathered up, it must be sensitive to cues from the rider’s inside hand and leg. Diaz develops these skills in a horse away from the pattern to make sure she’s got its full attention. Diaz’s drill is helpful when preparing for a tricky arena setup, as it teaches a horse to stay off inside pressure and wait for the rider’s cues to get in position for the turn. She starts at the same point in the arena she would begin her run. At a walk, she’ll ride up to her rate point at the first barrel, and when she sits, she expects her horse to “sit” with her. 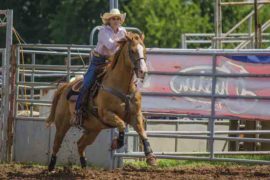 She will continue making right-hand turns around the barrels, going from the first to the third barrel—noting the drill will also help a horse that wants to bow off the first. Reaching the rate point at the next barrel, Diaz picks up the nose and shoulder again with her inside rein and foot, keeping the horse moving forward and away from pressure but making sure the hindquarters stay engaged. If a horse is having a hard time keeping his hindquarters engaged, Diaz will break to a complete stop and move the hip in for him. If it drifts out as she moves forward again, she’ll take him around a second time to be sure he understands to keep that part of his body in position. Diaz works around all three barrels at a walk before starting again at a trot. Then, she breaks down to a walk when she sits down and picks up her horse to move him out. When she kicks up to a lope, she’ll break down to a walk or a trot at the barrels, depending on the needs of the horse she is riding. Diaz adds that high-strung horses like Rootie tend to get hotter as you work them, so they benefit more from slow work.